Our last event saw close to 100 Forge FC fans turn up to talk soccer and plan our groups future, as well as having Kyle Bekker come and say a big hello to everyone. This time we will have far more to talk about as we are almost two months away from the CanPL opening game. Bring your scarves, have a beer and get to know everyone in the group. As always we will have scarves for sale, and begin our plans to make section 112 the loudest in Canada. 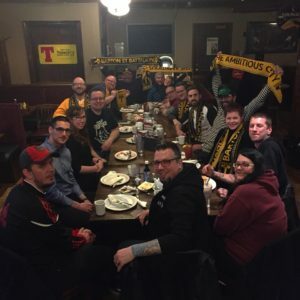 New members are always welcome, the group is entirely made up of like-minded people who love soccer and are excited for Hamilton to once again have a professional soccer team. Now the holidays are over, it’s time to get down to the planning for April and the kick off of the Canadian Premier League and Forge FCs home opener. 4 players have been announced, but there is still so much to come. More players, schedules, jersey releases and much much more. Bring your scarf, bring your friends, bring your ideas. Another great chance to meet everyone in the group, have a drink and some food and help shape the real start of this group for the season ahead. To all newcomers, please feel free to come along and get to know everyone. It wasn’t that long ago we were 4 people in a pub dreaming about the season starting, we are now over 350 strong. Hope everyone can make it, looking forward to seeing you all. *We will have scarves for sale! Bring your scarves (or come out and grab one) and catch up with the first supporters group of the CanPL! If you are new to the group or looking to join this is the perfect way, come say hi, pick up a scarf and get to know the group! *We will have merch for sale! 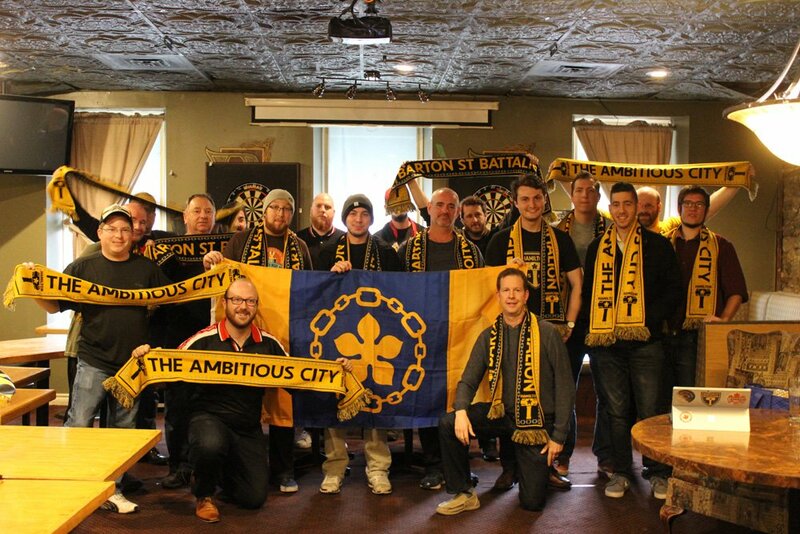 Forge FC – Stand with the Battalion! #ForgeFC season tickets will be on sale early next week. 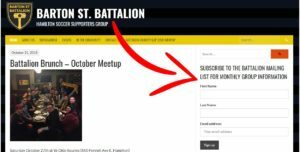 The only way to stand with the Battalion for $199 in section 112, will be to subscribe on our email list, which can be found to the right of this post. We will be sending an email out late this week. With October 29th ticket sales also coming up quick, we’ve had a lot of questions about what is required to stand with us in ‘112’ come game day. We are working to finalize these details, and plan to have information to share with you on the 27th (or sooner). Bring your scarves, grab some brunch and catch up with the first supporters group of the CanPL! *We will have merch for sale as well! 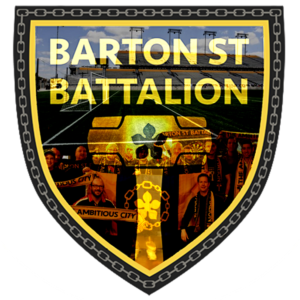 Barton St. Battalion Charity Cup kicks off on the 18th of October, playing on the same pitch we will all be watching Forge FC, Tim Hortons Field. Teams from Niagara, Mississauga, Kitchener, Forge FC as well as our own Battalion will be competing to raise money for the brilliant Interval House of Hamilton, their mission being ” Violence free lives for all women, children and communities”. Very pleased to say 100% of the money raised will be donated to them. As for the format, an 8 team, 7v7 tournament, (including goalkeepers) where each team will play 3 x 20 minute games, plus a final will be played that evening. There will be 2 groups of four teams competing, the winner of each group advances to the final. The tournament is open to men and women. We request players be over the age of 16. There is no limit to the amount of players per team, (we would suggest 12 minimum) and the cost to each player per team is a minimum of $10. Some teams have amazingly committed to $20 per player. After all, it’s for a fantastic charity! Please give any amount you can, it is more than greatly appreciated. Let’s make this a great night of soccer under the floodlights, whilst raising lots of money for a truly worthy cause! As our group keeps growing, some questions keep appearing. Hopefully this helps. As we inch closer and closer to kickoff, the league will be covering various topics surrounding its clubs and supporters. 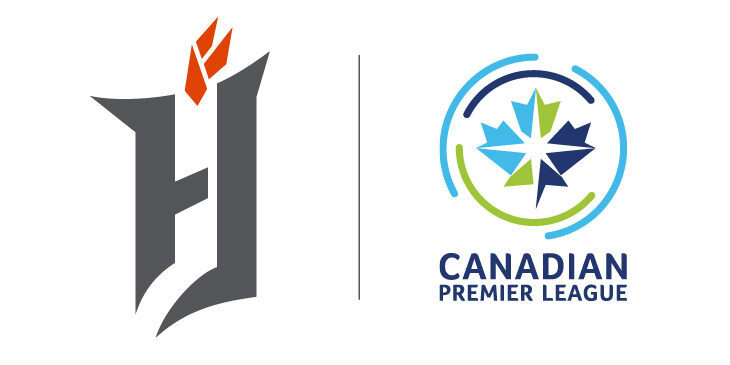 Earlier this week, Armen Bekadian with CanPL.ca sat down with our very own Allan Gorman to discuss where we’ve come from and where we hope to be going within the next few months. We’ve been patiently waiting for you. On warm Thursday evening at a Tim Hortons Field, the club’s name, colour and badge were unveiled to all those in attendance. 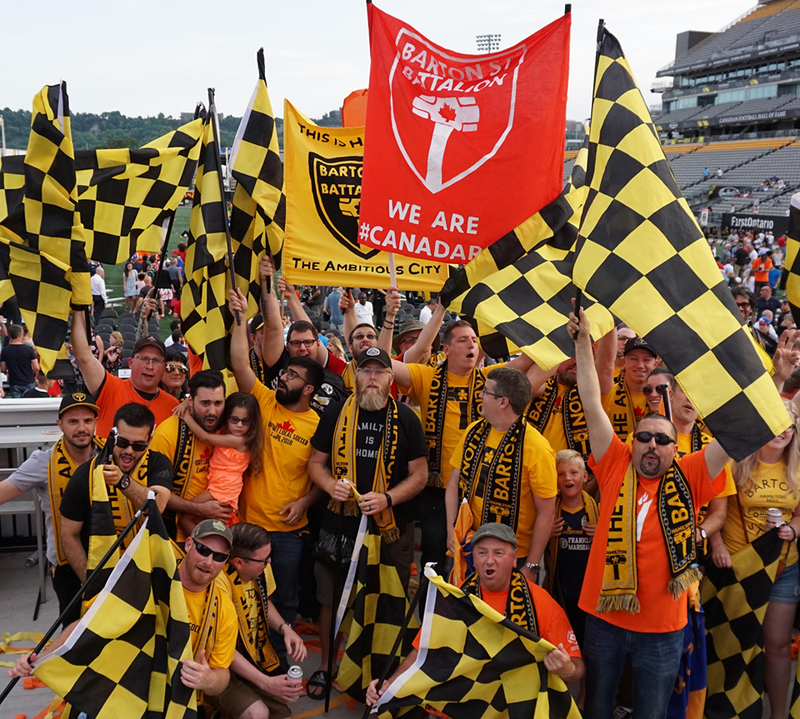 Forge FC are the founding member of the Canadian Premier League. The Battalion were invited to stand behind the stage in the north end and participate in the proceedings. The Forge FC website has a breakdown of the logo details and inspiration used to create it. We’ve begun placing our $50 memberships, which will be credited towards season’s tickets. The club was gracious enough to grant us the first 75 membership placements. If you haven’t put down your deposit, please hit up the website and come join us. All are welcome. The evening wrapped up at The Capitol Bar, for laughs, songs, beers and excitement. Keep an eye out on Facebook, Twitter and Instagram for upcoming Battalion events. Join us. 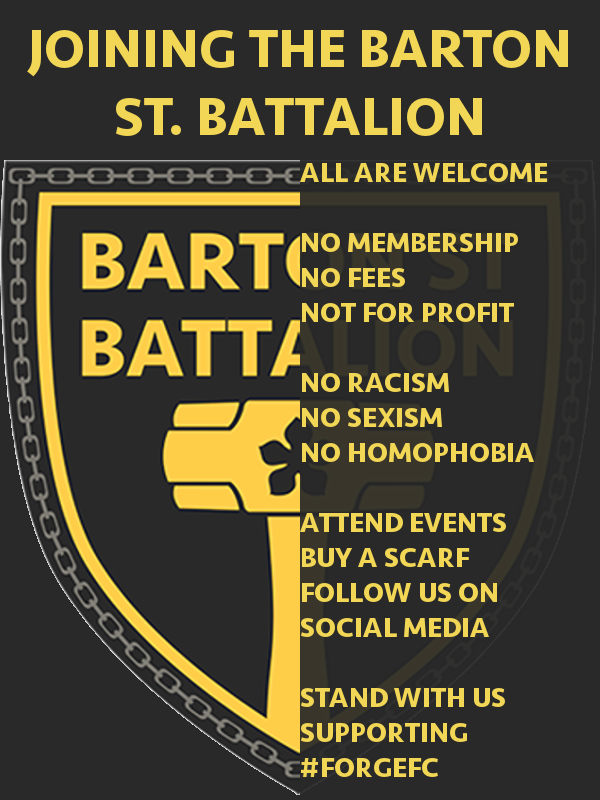 Battalions, some information ahead of our launch. Gates officially open from 6pm, but we as a group can enter from 5pm onwards, at gate number 3. We will have a Battalion booth on the field, head to that as you enter. 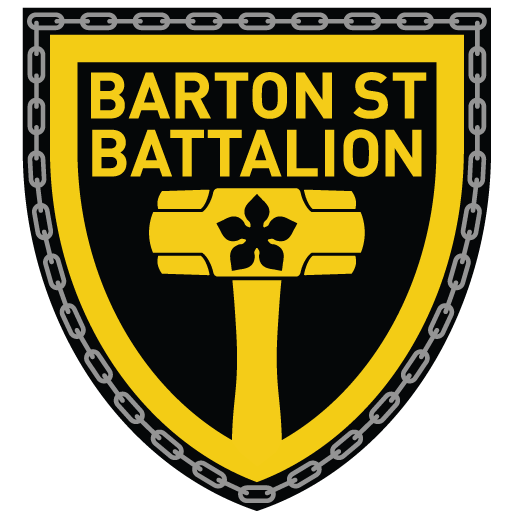 Membership sign up for Barton St Battalion will happen between 5-6.30pm. It will be a $50 deposit by card. The membership number you recieve is your place in line when the team begins calling fans for the purchase of seasons tickets, i.e. member 57 is the 57th phone call the club make. A membership allows you to purchase multiple season tickets, so families etc will only need to pay one $50 deposit for one membership. Our booth will have merchandise for sale, and it will also be where deposits are taken, by the club. We as a group will all be invited on stage during launch, which starts at 7pm, so we will all need to be massed together prior, around 6.45. After the event ends, we will all be heading to The Capitol Bar for drinks to celebrate. Make sure to bring and wear your battalion scarves and any other gear you already own. We will have about 40-50 flags to wave, as well as drums, banners etc. Hopefully this answers all questions, and again apologies for it being late notice. It is going to be a great day, it looks like a huge turnout. Hope everyone is just as excited. Soccer returns to Hamilton, and we will all be there to witness it.